Chris Short was an outstanding lefty starting pitcher who in these parts is forever associated with the ill-fated 1964 Phillies. But he had a lengthy career in Philadelphia, a Phils pitcher for parts of 14 seasons spanning Connie Mack Stadium in the 1950’s and Veteran’s Stadium in the 1970’s. For a 6-year stretch, from 1963 through 1968, he was one of the top starting pitchers in all of baseball. Short was also an interesting story off the field. His nickname was “Style”, given him by teammates because he actually lacked any in his dress. He was described in a recent article by Frank Fitzpatrick as “different…in a harmless way” by former road roommate and fellow Phillies pitcher Art Mehaffey, and as “happy-go-lucky” by fellow Phils pitcher and Baseball Hall of Famer Jim Bunning. Born in Milford, Delaware, Chris Short’s talent difference was first noticed on the field as a teenager. A standout at Bordentown Military Institute in New Jersey, where his father, a judge, had sent him to instill some discipline, Short signed with the nearby Phillies as an amateur free agent in June of 1957 at age 19. Short began in the Phils’ farm system at Johnson City in that summer of 1957 as a 19-year old. He was wild, as are many young lefties, but his talent was obvious. Over the next two season, Short would work his way steadily up the club’s organizational ladder. He made 76 starts from 1957-59 at 3 levels, accumulating a 34-24 record with a modest ERA, and allowing significantly fewer hits than innings pitched. In 1959, Short got his first taste of life in the Big Leagues. He made 3 early season appearances with the Phillies, getting one start each in April and May. He would get beaten up to the tune of 19 hits in 14.1 innings, amassing an 8.16 ERA, and with just a 8/10 K/BB ratio, but would go on to a successful year with AAA Buffalo. Short began the 1960 season back at AAA, but it didn’t last long. Just a week into the season he got the call back to the Majors, and would spend the rest of the season there with the parent Phillies. Used exclusively as a lefty reliever through June 2nd, Short made 11 appearances out of the pen and was having success. In 17.2 innings he was 2-0 and had allowed just 14 hits. It was then that manager Gene Mauch decided to give the lefty a shot in the rotation. During June and July of 1960, Short made the first 10 starts of his Big League career. 2 of his first 4 outings were complete game victories over the Chicago Cubs, one at Wrigley Field and the other at Connie Mack. Short would slow down, losing his next 7 starts, including an 0-5 July. Sent back to the bullpen, he again thrived, with a 2.61 ERA during 20 games in August and September, allowing just 26 hits in 31 innings. When 1960 finished, Short had appeared in a total of 42 games, 10 of them starts, and had allowed 101 hits in 107.1 innings with a 3.94 ERA. He wasn’t dominating, but he was more than surviving as a 21 year old. During the 1961 and ’62 seasons, Short continued to bounce back and forth between the rotation and the pen. Battered a bit in 1961, he regained some equilibrium with a solid 1962, and finally in 1963 at age 25, Chris Short became a full member of the starting rotation with the Phillies. He made 27 starts, going 9-12 with a 2.95 ERA. He also had amassed 198 innings, striking out 160 batters. The “Whiz Kids” team had won the 1950 NL Pennant, and their successors hung around the .500 mark for most of the next half dozen years, finishing between 3rd and 5th place. But from 1958-61, the club finished in last place each year, with each season successively worse, sinking from 69 to 64 to 59 to a low of 47-107 in 1961. But along with Short’s improvements, the entire Phillies team was finally beginning to show signs of life. The 1962 Phillies didn’t fair much better in the standings, finishing in 7th. But it was better than last place, and their final record was actually a winning one at 81-80. It would prove a sign of things to come. The 1963 Phillies would go 87-75, finish in 4th place, and with some young, exciting players like NL Rookie of the Year Richie Allen the future was finally looking brighter. In 1964, Chris Short became an NL All-Star for the first of what would be two times. He also received some NL MVP votes for a season in which he would finish 17-9 with a 2.20 ERA, pitching 220.2 innings over 42 games, including 31 starts. The Phillies that year ran out to a big lead in the National League, and appeared primed to return to the World Series for the first time in 14 years. And then the infamous collapse came. In the final week of that 1964 season, manager Gene Mauch pitched his top two starters, Bunning and Short, or two days rest not once, but twice each. Bunning would be completely bombed in his starts. Short didn’t pitch so poorly, but following a complete game victory over Houston on September 14th that raised his record to 17-7, he would not win again. The Phils famously let a 6 1/2 game lead with 10 to play get away. Still, the Phillies appeared poised to be one of the top clubs in the National League for the next few years. It never materialized. Though they had a winning record each year from 1965-67, giving the club a stretch of 6 straight winning seasons during the 60’s, they wouldn’t again come close to winning a Pennant. Short fully established himself among the top hurlers in the game during that era. His seasons during that period were key pieces to the Phils’ winning run. He went 18-11 in 1965, pitching a career-high 297.1 innings with a 2.82 ERA. In 1966, Short again received MVP votes during his only 20-win season. He went 20-10 with a 3.54 ERA, pitching 272 innings across a career-high 40 starts. His 1967 campaign was the 2nd All-Star season of his career, but injuries cost him an entire month from late-May through late-June. As a result, his record was just 9-11. But he fashioned a 2.39 ERA, allowing just 163 hits in 199.1 innings. In 1968, Short was again strong, going 19-13 with a 2.94 ERA and tossing 269.2 innings. As the 1969 season approached, Chris Short was just 31 years old, and appeared set to ring out his successful decade with another strong year. 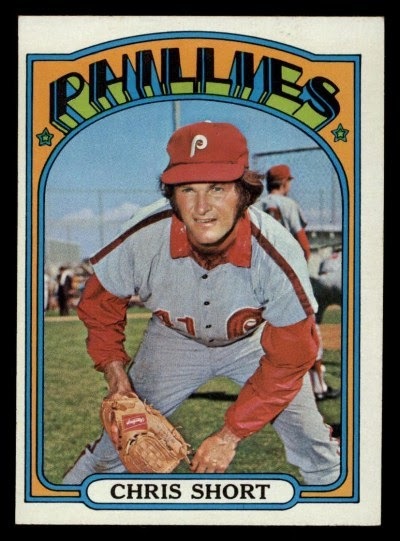 It was 1969, the “Summer of Love” in the United States, that would prove anything but for Short and the Phillies, and that would in fact prove to be the beginning of the end for his career. That year, Short suffered a back injury that would require surgery. Though he would pitch in parts of the five seasons from 1969-73, he would never again be the same level of pitcher as his mid-60’s dominant peak. It all started innocently enough. He lasted just 4 innings in his first outing in Chicago on April 8th. His next start was not for a week later, home at Connie Mack against the Mets. Short battled through 6 innings against the Mets 22-year old rookie phenom Gary Gentry, but the Phils trailed 3-1. In the top of the 6th, Short got Amos Otis to ground weakly to 3rd, and then struck out the last two hitters he faced, Ron Swoboda and Jerry Grote. In the bottom of the inning, Short was lifted for a pinch-hitter, Johnny Briggs. He would not appear again in 1969. 1969 became a lost year for Chris Short, with the surgery knocking him out, and it was a lost season for the Phillies, who in the first year of a new divisional setup would finish in 5th place out of 6 teams in the new National League East Division. In fact, it would mark the first of 5 straight seasons that the Phils would finish either 5th or 6th in the new setup. Short was able to return for the 1970 season, the team’s final one playing in Connie Mack Stadium. The old ballpark at 21st and Lehigh Avenue had been in existence since 1909 when it opened as Shibe Park, the name it would carry until 1953. The Phillies had left Baker Bowl at Broad & Lehigh and moved into Shibe, the home of the Philadelphia Athletics in those days, in 1938. In his 1970 comeback, Short went 9-16, making 34 starts and pitching 199 innings for a 5th place team. It wasn’t the strong seasons that he had been pitching, but he was healthy and was able to take his turn the team ended the Shibe/Mack Era. When the Phillies opened Veteran’s Stadium in 1971, Chris Short was not just a regular member of the starting rotation, he was their Opening Day starter at Pittsburgh. He would pitch at The Vet for the first time a week later, on April 13th, 1971, losing to those same Pittsburgh Pirates. Short would finish 7-14 in 1971 with a 3.85 ERA. He pitched 173 innings across 26 starts. But at the end, he was being eased out. After getting ripped in what was his final start at Pittsburgh on August 30th, Short was relegated to the bullpen, and from there he made just 4 appearances in September. 1972 would prove to be Chris Short’s swan song in a Phillies uniform. He was used exclusively as a lefty reliever out of the bullpen, and in fact seemed to be settling into the role. Struggling at first, he was excellent over his final dozen appearances. Short registered a 1.72 ERA in those 12 games, striking out 14 and allowing just 11 hits in 15.2 innings. But it was a game on June 27th that sealed his final fate in Philly. June 27th, 1972. First game of a doubleheader between the Phils and the Chicago Cubs at Wrigley Field. The Cubbies started former Phillie and future Hall of Famer Ferguson Jenkins. The Cubs had a 2-0 lead into the bottom of the 6th, and Phils starter Jim Nash was in trouble thanks to some awful defense. With runners at 1st and 3rd and nobody out, manager Bob Skinner called on Short to put the fire out. Instead, Short’s two walks (one intentional) and a wild pitch helped it blaze into a 3-run inferno. It would be the final appearance by Short in a Phillies uniform after 14 seasons stretching back to the 1950’s. Chris Short was released by the Phillies in October of 1972. He signed a month later as a free agent with the Milwaukee Brewers. In 1973, Short appeared in the final 42 games of his career with the Brewers, including 7 starts. His last win as a starter came on June 1st at Milwaukee County Stadium, a 5-3 Brewers victory in which Short went 6 innings, scattering 6 hits and 2 walks while striking out 4 to beat the Chicago White Sox. His actual final game was not so glorious. On September 18th against the Cleveland Indians he failed to retire a batter. Called on to protect a 5-3 Brewers lead in the bottom of the 9th with 2-on and nobody out, Short yielded a 3-run walkoff homerun to pinch-hitter John Ellis. It would be Chris Short’s final time on a pitching mound. Short retired from baseball at age 35 with a final record of 135-132 across parts of 15 seasons in Major League Baseball, 14 of those with the Phillies. Hit pitched in 501 games, 308 as a starting pitcher. In his 2,325 innings he struck out 1,629 batters and yielded 2,215 hits. His career ERA was a respectable 3.43, and he had even accumulate 18 Saves along the way. To this day, Short is high on the Phillies all-time career pitching lists: 4th in Wins (132), 4th in Games (459), 3rd in Starts (301), 4th in Shutouts (24), 4th in Innings (2,235), and 3rd in Strikeouts (1,585) and he was selected to the Phillies Wall of Fame in 1992. In 1979, Short was inducted into the Delaware Sports Museum and Hall of Fame. Short never got to see his plaque on that Phillies Wall of Fame. He was inducted posthumously after dying tragically young, on August 1st, 1991. He battled health issues for years, including diabetes. Alone in his office, working as an insurance agent, Short had suffered a brain aneurysm in 1988. Hospitalizations and rehabs followed, but Short never recovered, finally succumbing at just age 53. Chris Short is considered by many to be a bit star-crossed, his story somewhat tragic, particularly due to the circumstances of his post-baseball career and his life’s shortened and difficult ending. But it must always be remembered that Chris Short also lived the dream. He not only reached the pinnacle of his profession in Major League Baseball, but he became an All-Star, was one of the best pitchers for the entirety of the decade of the 1960’s, and in 1964 very nearly helped lead his team to the top. He should be remembered fondly always by Phillies fans everywhere.